Doors are focal points in every home. They come in different colors, styles, and materials that enhance curb appeal. Doors can also protect your home from different elements, ensuring comfort and safety for many years. 1. Drafts – Just like entry doors in St. Louis, MO, patio doors come in different framing materials. If not installed properly, you might notice gaps around the frame. These gaps can let in cool or warm air outside your home, affecting energy efficiency and indoor comfort. Lack of caulking or weatherstripping also causes air leaks. 2. Old age – Doors, like other components, have a service life. If your doors have reached the end of their life span, invest in durable and more efficient options. 3. Difficulty in operation – Elements can cause door hinges and locks to malfunction. This means that you cannot open or close your patio doors properly. Damaged hinges can also cause hanging or misaligned doors. 4. Dents, scratches, and other types of physical damage – Strong winds, intense heat, and heavy rain can all take their toll on your doors. When you see any physical damage to your doors, have them replaced immediately. If you replace your doors today, you can improve the look of your patios while and protect your home at the same time. New patio doors in St. Louis with energy-efficient glass also lower monthly utility bills and create a cozy indoor environment. Other benefits include ease of operation, security, and added property value. 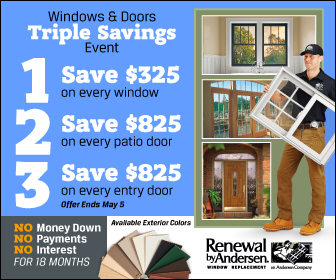 For reliable and efficient patio doors, trust Renewal by Andersen of St. Louis. Our patio doors come with energy-efficient glass, durable framing materials, and various customization options. This way, you can select the right patio door that will blend with your home’s architectural style. If you need quality door replacement for your home, call us today at (314) 332-2364. You can also schedule a free in-home consultation through our contact form.